Interested in subscribing to Peter and Jerry’s Podcast? Type “Flip Guys” in the search bar on the top right side. Click on the big box that says “Flip Guys”. After page opens up, hit the “Subscribe Free” button. Read what those who have Listened to Flip Guys Podcasts have to say…. If you've ever wanted to learn about real estate investing, this is where you should start! They know there stuff and lay it all out in a way that is simple and easy to understand. They seem genuinely interested in my success and I'm already working on putting together deals! Thanks Jerry and Peter! I have been involved with real estate for over 30 years. The information you provided is very detailed and informative. It is nice to get information with no up selling of other products. It seems that many webinar type programs are nothing more than a carrot dangling just out of reach. I look forward to hearing the remaining podcasts and any future updates. Great job! Being relatively new to real estate investing, I appreciated the up front, honest approach of the flip guys. They presented some very unique investment strategies along with realistic expectations on income. This is a great place to start even if you have not done any real estate investing before! Great content!! I'm grateful I found you provide step-by-step instructions rather than just a vague overview of flipping. Also, gives cutting edge strategies to use to be successful in real estate investing. It is obvious you want your students to succeed. I can also tell you are ethical in your interactions with others. Wow... talks about powerful information! These podcasts are wonderful and really paint a clear and concise picture of how to get involved in real estate no matter what your present financial situation is! So much important info is packed into each segment; this is a great learning tool! After each podcast, you're left wanting more and wanting to find out how we can partner with this respected real estate duo. It's a beautiful win-win situation when you can learn how to become a better business person and make a wonderful living all while helping people stay in their homes and revitalizing neighborhoods thru fix n' flips. What could be better?! Oh and LOL, I love the “movie voice guy” during the intro... HILARIOUS!! I'll definitely be listening to each new podcast!! I've heard many try to teach real estate investing and are doing well themselves, but when it comes to really being able to teach AND HELP others to start this is where many programs fail. The Flip Guys have a well rounded program that not only teaches but has the support and funding to REALLY HELP students to succeed. I've listened to all of the podcast, viewed website material, read what their courses cover, and what others have experienced working with these guys. Now I'm part of the program. Great resource to learn how to prosper in real estate, and there's no better time than now. Thanks Peter and Jerry! Hello Peter and Jerry- I came across your podcast and am really excited to hear what two veterans have to share about investing. Since you've recently just started this podcast, I figured I'd start from the beginning and work my way to the front. I'm a new RE Agent with a keen eye on investing. I'm so impressed with your scope and knowledge. (I thought most investors would like to squelch this kind of valuable knowledge from other investors) I'm confident that I'll be able to apply what I learn to be able to help others, beautify neighborhoods and make money. Thanks for sharing. I'll be sure to pay it forward as I learn and grow! Can believe this is free, really enjoyed you guys talking about the REO deals... …really good stuff! Congratulations!!! Highly educational & entertaining. Strategies for the times...for today`s real estate investors! Looking forward to more, more, and more! Please keep it coming! Congratulations Peter and Jerry for putting together a series of podcasts that are Informative, Insightful, Entertaining and very thought Provoking. I have thoroughly enjoyed listening to them all. The podcasts and the articles listed within your website have inspired me to take that first step into establishing my own Real Estate Investing Business. Glad to see the Flip Guys finally has a podcast to share such valuable, market-appropriate information. Just heard the first two episodes and will be listening to all of them over the weekend (a flipping marathon, if you will). Great timing guys. Looking forward to the weekly shows! Good overview for getting started in real estate investing. I'm looking to change careers, though late in life, to have a more comfortable living, without the physical work. I am excited about this field, and Peter and Jerry are presenting this as a very possible scenario. Great information about different flip strategies. 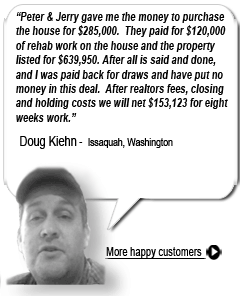 Back flip strategy is a great way to help troubled struggling homeowner and commercial owner. Keep up the great work. I absolutely love it! Keep up the good work! I enjoyed the podcast. I listened to them and after listening to podcast 5 I jotted down some notes and scheduled an appointment with a property manager for one of my investors. While waiting for him, I listened to podcast 8. Thanks for addressing the concerns of private lenders. I paused in the middle of the podcast, met with him for about 20 minutes, and then finished podcast 8. Many folks are selling talk with no applicable strategies. You guys provide strategies that work. Thanks! I really enjoyed the podcast. I found the information very interesting. Your talk is inspiring for investors like me who are just starting out. You summarized the four techniques very nicely and put a clear perspective on what one can expect to learn from your podcasts. Thank you. I really got into the idea of residential back flipping high end homes. The explanations are clear and full of details. I especially like that the home owner gets to keep the house. I stumbled on this podcast and have enjoyed every minute of it. I have had a passion for real estate for over a decade, and own a few investment properties I acquired through the traditional means. I have an MBA focused on Entrepreneurship and Real Estate, and have learned things in this podcast that I had never considered before. I currently work for a private equity firm focused on fix and flip real estate, but I have never heard of back flips (and could have never thought of it myself). I hope you keep doing what you do, and I will soon join your mentoring groups. I have listened to more than one of Peter and Jerry's podcasts. I have also attended several of their webinars. They are the real deal. Professional, easy to understand. They present information that will change your life. In this new economy you need information you can trust. You get two mentors that are successful doing what they love to do. Definitely worth listening to. In today’s market getting an appraisal for lending can be challenging to say the least. Market dictates the price and then you get a low appraisal back! I have one going into contract and will be using these tips to see if we have an appraiser who knows the area and market or not. Great tips! I've been investing in real estate for over 10 years now and I've done it all from wholesaling to rehabbing to lease options and I had never heard about the residential back flip. This is great!! I love hearing about new ways to make $$$$ in real estate. Can't wait to get started!! Way to go guys for finding innovative strategies. Jerry and Peter are rock stars! Thank you for providing us aspiring investors great information and innovative strategies to profit in these troubling times. I will definitely be tuning in to listen more. Jerry and Peter do a wonderful job of taking real estate investing down to its most basic principles and then, methodically, tackling each principle. For those of you who want to start your real estate investing career, these guys know their stuff, and more importantly, can convey their knowledge into simple, manageable terms. For those of you who are veterans in real estate investing, Peter and Jerry stay at the forefront of market and trends and, therefore, are able to bring you the newest, latest, and greatest ways to make money in real estate, i.e., Residential/Commercial Back Flips. I wish I found these guys when I started investing; it would have saved me time, many mistakes, and a lot of money. Once again Peter and Jerry offer straightforward advice as they share their own experiences. Seasoned investors and novices alike can benefit from this duo's knowledge. A host of tips and lessons is presented in an easy and casual setting. If you're interested in great ideas and want to learn something new, give Peter and Jerry a try. Love the question and answer format and practical and actionable information with great ways to make money in residential real estate. Just starting my wholesale career and Jerry was very helpful. Love the market analysis information on buy and flips. The back flip strategy is just mind bending. You guys are amazing. Overview of Podcasts #1-8: Peter and Jerry’s presentations are highly informative and contain key, critical points about what is important to being successful in flipping real estate £ whether it is wholesaling, fix-n-flipping, or back flipping (a method coined by Peter and Jerry) for buying notes from banks at a discount and renegotiating new notes with the same owners either in a residential or commercial setting. If one wants to get a very powerful overview about what is most important in each of these flipping methods, these podcasts certainly deliver top content. The podcasts are arranged in fairly short (average only 30 minutes each) presentations that are easy to listen to and fit into most busy peoples£ schedules. The high content relevance and time efficiency of the podcasts give them high value for today’s investor. Podcast #1 - How to Get Rich Flipping Real Estate: In this as well as the other podcasts, Peter and Jerry incorporate feedback from their investor audience to determine topic and content. Podcast #1 gives a very concise overview of the four flipping system. It incorporates important key tips (for example, always have an exit strategy! ), as well as issues to avoid. Podcast #2 - How to make $50K Flipping High End Homes: Here, Peter and Jerry describe the incident that led into back flipping (a term they have coined). They give a very good overview of what the residential back flip is and how it works. Podcast #3 - How to Pick Winning Fix and Flip Deals: This excellent, concise presentation covers key questions about: a) picking the right price range to focus on to make $25K-$50K profit, b) the importance of understanding the ideal buyer; c) key factors to watch out for or pay close attention to when making the purchase for the Fix n Flip deal. The advice is invaluable to any fix n flipper! Podcast #4 - Making Big Profits Without Owning Real Estate: This podcast presents the Residential Back Flip in more detail and serves as an extension to Podcast #2. It covers the key financial calculations in determining the Buy Price of the Back Flip and also answers frequently asked question by investors interested in the Back Flip. Podcast #5 - Quick Ways to Make Cash with Quick Flips: In this podcast, Jerry describes an awesome method for transferring ownership to another buyer (and getting around the banks block to assignment of title) and avoiding double closings. The podcast also covers important information about: a) using the inspection contingency period to find a buyer or if absolutely necessary, to get out of the deal; b) novel and powerful approaches to building a buyers list. Podcast #6 - Back Flip Commercial Properties and Make Big Profits: This podcast provides a great overview of the Commercial Back Flip… what it is and how it works. Four criteria necessary for these methods are described. The podcast also covers the key financial calculation for determining the Buy Price as well as the new loan price for refinancing the deal with the owner. Podcast #7 - Winning the Appraisal Game: Very valuable, (or should I say INVALUABLE) information that can make or break an investor doing flips! The take-home message is: Don’t do flips of any sort without listening to this Podcast! Podcast #8 - Why Investors Give Money for Flip Guys Deals: This podcast explains how much of the funding for investments is acquired, and how you also can become a Private Lender. The content includes both sides of the fence views… the investors and the private lenders… on how a deal is funded. The insight is helpful for establishing and developing relationships with both private lenders and investors. Really....thanks guys for providing these podcasts. It is said that you only get what you pay for so I was astounded to find the level of information that you provide in these free resources. I've listened to each of them now, and have learned so much from each one. I've purchased other training courses in the past, and this is the first I've seen that really gets into the nitty-gritty detail of the subject matter. You ask and answer the questions I would have asked! Great job! Some good tips. They emphasize that the real key is good analysis and be willing to walk away from the deal. You can't just wish a deal to work. I'm looking forward to listening to more of the podcasts. My only unknown is that they will divulge more specific information on the nuts and bolts of doing a deal. They claim they will let us know formulas in the next podcast and, if true, I can hardly wait! Thanks for the great content... it seems like the investors that have ready, liquid funds for the deals you discuss have a high awareness of the best use of their time and money. Let the professional realtors find and negotiate deals while the investors sit back and gain high return on investment. Obviously, one must earn the trust... I'll definitely listen to the other podcasts here! The Flip Guys podcast is BY A MILE the best, and most inspiring, real estate show on iTunes. Peter Conti and Jerry Norton share their real-world investing strategies that actually help get deals DONE. They explain the keys to successful investing in a way that is accurate, simple, and most of all - actionable. I am officially hooked! Thanks so much, Peter and Jerry. I'm thrilled to have these on audio. I spend a lot of time driving, and these are an excellent way to turn my car into a real estate “university”. Jerry was right, passive cash flow doesn't always work, and these podcasts provide excellent alternatives for those of us willing to do the work. Way to go guys! These guys are great! They know their markets and they know what works. They also are not like other gurus who take your money and flee, leaving you broke with no other way to get started. I have bought many other Real Estate programs and these guys truly come thru as some of the best. They also truly have a heart for others to succeed and are not all about dollar signs in the end. Thank you guys! This podcast is another way the Peter is answering our questions and making us better real estate investors. Thank you! Always great stuff from these guys. Took one of Peter's mentorship trainings a few years back and was very impressed with the level of professionalism and hands on training. He's puts you directly in the game suited up. Thanks guys for always pushing things further and providing us all with great content. Keep it going. Thanks for all you've done for us and especially for the skill and integrity you bring to the art of real estate investing. It was also a very special moment in our lives when we recently presented the $1,200.00 check you contributed to our favorite charity from your share of profits on our first deal. It warmed our hearts to see all the good that comes from working with the right people, with the right intention at the right time. Thank you, again! A perfect supreme quality product that is flexible and user friendly makes it possible to enjoy a life beyond imagination. After reading Peter Conti's books, I expected this podcast to be a rehash of the old material. Boy, was I wrong! Peter & Jerry cover some exciting new ground and share a lot of valuable information and concepts for FREE! This is definitely one real estate podcast worth listening to. All I can personally say is “wow”! This strategy is so cutting edge, and you can tell the idea or concept comes from people who have done deals. You just do not think of strategy of this quality without experience. As a newbie who is terrified of losing money, I'm always looking for information that I can trust to build my knowledge - before I take the leap. The Flip Guys Podcast has given me so much valuable information. I can't wait to finally put the info to use. Awesome! This is what the Masses need! Someone to break it down for us, put it in lay terms. This, if listened to every week will drastically change your business and your life! Exiting opportunity to create wealth. From the funny intro to the great info in the rest of the podcast these are all worth listening too! I really enjoyed podcast #3 because I am in the middle of a fix and flip and learned some great tips to avoid and learned I am doing some things right. It increased my confidence and my knowledge. Good afternoon gentleman. Just finished listening to the commercial back-flip podcast. Very informative as are all the other podcasts that are offered. I get pumped up, but then I hit the wall of -what do I do next - I know your answer is to purchase the materials except that I am unemployed and have the funds to pay the bill. Don’t get me wrong I am getting as much info as I can from your source as well as others for free. It's out there so no excuses. Right now I am trying to locate funds so that if the opportunity arises I can run with it. In that event I know that I can contact you for a referral. Have a great day and thanks for the free info that you put out. Good info. I am a certified RE appraiser and I was ready to pounce on any misinformation but these guys know what they are talking about. Great comedy theme beginning! I appreciated your thoughtfulness towards us who are trying to get into this business. Thanks for the loads of free education on wholesaling, fix and flips, and back-flipping properties! Great info. Big learning: go for the bigger deals as it takes as much effort as the smaller deals. Be willing to pass on deals where profit is not there. Great information for the first time investor and experienced. I'm always a big fan of any information you provide. Thank you !! You’re two Awesome Flip Guys!! Great podcast with lots of content! I thought it was good because it was highly informative. Not a bunch of tooting your horn or selling. This is an important thing to do to save America from total collapse. I always wanted to invest in real estate. I felt the little guy just could not compete with the big guys on Wall Street. I listened to one of Peter's broadcasts on multifamily investing and decided to take a chance. It was great. I was then able to get some equity refinanced and used the money to buy another property. My income went up by over $60K on a net basis per year. I'm working on my third property right now. This guy gives it to you as it really is. He opened my eyes, he can do the same for you. I am impressed with the appraisal issues this is something no one else has taught me or shown the importance of. Thank you again. I am impressed. All 8 episodes were full of information that is a must for anyone buying and selling properties. I am waiting for the appraiser report on my property now. I wish I could have listened to episode #7 before today. Thank you Peter and Jerry. I am new to your strategy but I feel confident that I can apply your techniques for the Back Flipping of commercial properties here in San Diego, Ca. This is a rare and wonderful opportunity and I thank you for allowing me to be a part of it. I am very new to this - haven't done one deal yet, but I have been reading, listening for several months gathering information. So I am so glad you guys are doing the podcast because I can still work and listen at the same time. I'm excited, and afraid to start, but then what do I have to lose. Thank again. I appreciate knowing what neighborhoods to focus on: not the poor and downtrodden neighborhoods but those with a lot of real estate activity. I appreciate knowing what to expect of the realtor and what realtor to look for. I am awaiting the time when I will be able to listen to the next presentation where you will describe your formulas for expected fix up and sale prices. I can now see how easy it is to find people who need out of a sticky situation and provide help to them.It's a win-win-win for all parties involved. I have been a real estate investors 'buyers virtual assistant. 'I have been a real estate agent. I have been a real estate appraiser. I know I can do this. I'd like to contribute, it's what I do!! Thanks! I found the podcast very inspiring. Definitely has me motivated! I found this a few weeks ago and it came along at the time I was preparing to do wholesaling but didn't know where to start. This podcast has been succinct in how to do just that. It gives a lot of information in a short period of time so that you have to listen to each podcast over and over. The pitch is just right, not like some of those others that you can hardly hear them or the volume is up and down. (I was that way on my podcast...) Take a break, lay on the grass as if you're on the beach, right after a rainstorm and you see that rainbow glisten in the sky. You get up and drive and follow until you actually end up at the end and there's that pot of gold! Well, this podcast is sort of like that in its' learning appeal -- a pot of gold. I have been a member here and love that the info and help being provided here for free is a wonderful deal that one shouldn't pass up. I have listened and re-listened to now ALL of your podcasts it seems that every time I get some different nugget from you guys. I love your creativity. I also have a big real estate guru that said to me if you find me a better strategy of doing real estate in this market I will implement and join forces. So, I would love -absolutely adore to PROVE him wrong and consequently ADD a huge following to US! I have looked at a few of Peter and Jerry’s programs now and I really feel that they are the real deal. I have been involved with other Real Estate Gurus and never got the commitments that Peter and Jerry offer. To finally have someone willing to finance and help you through all of your deals is what is selling me on their program. Thanks Peter and Jerry for finally being there to help me. Sometimes a little help to get started is all we need to succeed. I like that someone is willing to help many in this economy that want to be investors in real estate and have financial free and a wealth mindset. I listened to one of the podcast, and I might say, it was very interesting n quite amusing. I would say though, that just one podcast isn't enough. The information that you give on one of them, gives you just enough information to need more. So you can't just listen to one. But overall, they are very motivational. My main focus for getting into Real Estate was to have the freedom of not having to worry about where I'm going to get money from. I'm now into flipping beads. Lol. I make custom jewelry pieces. I've downloaded a lot of your podcast to my Ipad. And every day I listen to at least two in between everything else I have to do. And the clarity of the podcast on here is amazing. Such a crisp & clear sound. I really do need the mentoring. I'm like literally a newborn when it comes to Real Estate. I listened to real estate flips and it was awesome! Now let's go and do it, right! I am in...and will listen to more!!! I am very new to this - haven't done one deal yet, but I have been reading, listening for several months gathering information. So I am so glad you guys are doing the podcast because I can still work and listen at the same time. I'm excited, and afraid to start. I can now see how easy it is to find people who need out of a sticky situation and provide help to them. It's a win-win-win for all parties involved. I have been a real estate investors 'buyers virtual assistant. 'I have been a real estate agent. I have been a real estate appraiser. I know I can do this. I'd like to contribute, it's what I do!! Thanks! I love it. For us newbie’s, there is so much fear. Thank you for keeping things lighthearted and encouraging! I love the enthusiasm and great content of Jerry and Peter's podcasts! Valuable information that gets you eager to follow in their footsteps! Excellent info on what investors want, establishing a track record, benefit of coach, loan to value and rate of return, 65% purchase price for after repair value! Thank You! Excellent! I really enjoyed all eight of your podcasts. I’ve listened to them all. You guys give great advice and tips and hints for us newbie investors to learn and grow from. I look forward to joining your birddog team for commercial flip very soon. I recently joined by purchasing your back flip training, however, I have had prior training for fix and flip but after reviewing your fix and flip training I believe it gives greater detail. Your podcast gave insight to the money investor that I had not thought of yet. I do not have capital, so it was interesting to start thinking about how I will attract investors in the future. I also, learned more about how you work with your investors, which allows you to partner with students to do their deals. I really need to get my first deal done and look forward to presenting one soon through your system. I thought it was great. I need this for my kids so bad now that I’m injured. You guys are Angels. I thought gave great information about the rehab cost and private funding...Thank you. I TOTALLY LOVE THE INFO YOU GUYS PROVIDE. IT IS TRULY WORKABLE IN TODAYS MARKET PLACE. I HAVE RESEARCHED REAL ESTATE FOR YEARS & REALLY HAVEN'T DONE ANYTHING WITH IT DUE TO TOO MUCH INFO. A LACK STEP BY STEP INFO FOR TODAYS MARKET PLACE. SO THANK YOU VERY MUCH!!!!!! I`ve listened to a lot of videos & webinars on real estate investing. Your’s is the best info. by far. Thank you very much. I'm in! Back flipping real estate with Peter Conti is the most powerful concept, I have ever seen, to getting a check! I'm new to real estate investing, and the information you provided on Ways to Make Cash with Quick Flips was insightful. I like the straight to the point approach of how to briefly implement these strategies. Look forward to learning more from you guys. Informative and interesting. Looking forward to the next ones. What you guys share on the podcast is a very straight to the point information, and for a new Investor like me, the Back flip House and commercial properties, give us a complete new perspective to how make money in the actual RE Market. Before I listened to this podcast: Black flip commercial properties and Make Big Profits, I was thinking that to make money in any commercial deals will be almost impossible if you don't have a lot of money to invest; and now, wow, I have a huge different perspective of the endless of the possibility that we have. Thanks guys for so valuable information. I will be looking to keep in touch with you. Investing in Real Estate is great! And making money is really sweet! By adding the Flip Guys training to both of these…Super charges and makes Residential and Commercial investing Impossible to beat!!! Listening, it opened my mind up to flipping other real estate besides SFH. Also, the idea of flipping things other than real estate. I am looking forward to continue listening for more great ideas and how tos. I just started listening to flip guys and find them very entertaining, knowledgeable and forward thinking. Highly recommended listening. Listened to podcast # 8. I thought that the podcast was very informative and that it is a unique way to make money. Listened to Quick ways to make cash w/ quick flips. Liked the whole idea of setting up an LLC and assigning to buyer. Also liked your ideas of how to build up a buyers list. Extremely informative and helpful. I love the way you guys teach real state, from new to season investor can learn from your vast knowledge in this business. Thanks. Great presentation! I liked the practical, experience-filled approach. I listened to all eight. Each provided a unique value. The Mr. Movie Voice Guy was a tremendous opener. Keep the info coming! Peter & Jerry's podcast is great stuff! Peter & Jerry come to you each episode practically handing over dollars if you can act on what they're talking about. Cutting edge and innovative they take the info , dice and slice and hand it over to you in small tidbits. If I could only keep up with them at the pace of instruction, I'd feel more advanced. Thanks Guys you Rock! Peter and Jerry present an exciting idea to consider implementing in the current distressed market, allow a big problem to be solved while making money! Peter and Jerry, you guys are putting the fun back in the Real Estate game. I have been around for a long time, but you two have opened up my eyes again. Peter and Jerry.. you guys are awesome! Sound recommendations and extra-cool strategies you guys are executing... We want to work with you and your company. It is an incredible opportunity to leverage your experience, learn from your educational arm and your willingness to partner with others like us... the Residential Back Flip is so cool and we have properties we can do with you guys, running lead. Thanks guys!! Peter Conti, Jerry Norton and Mentor Financial Group, LLC have been helping investors since 1997 and there is no surprise to me why they have been so very successful. They keep their techniques and training simple without a lot of unnecessary fluff. Their training on How to Make $50,000 Flipping High End Homes; makes a great deal of sense and it is a win/win strategy for everyone involved. When we can save a family $200,000 on upside down mortgage payments, they can remain in the home they love, neighborhoods stop becoming empty ghost towns and the money saved can go back into the community, revitalizing everyone’s economy. Podcast for commercial flip was very informative, think it is better in video or webinar to see chart of different scenarios for beginners. Once you have learned the basics nuts and bolts the podcast are a lot of help to refresh or learn new tools. Thank you for all of your help in making Real Estate investments more fun and easier to get into. Especially for people like me who have limited money to invest. Keep up the good work. Thank you so much for just being two nice and easy going human beings with some incredible information. I support you both so very much and I really want to get started to help out some of my closest friends. I listened to 5 of the episodes today!!! I am ready to go...So wonderful!!!!! Thank you very much for the link to iTunes download, I loved the whole content of the podcast. It is the perfect way to constantly learn and keep up with different strategies . Thank You both,oh so Very Much. I Loved your Web/Video Information about Residential Back flips. Thanks for making Residential Back Flips information available. It makes it a double opportunity having the funding available from the Flip. Having a winning outcome for everyone involved in this transaction is the key. Reducing debt on a property without damaging credit, without changing ownership of property is a phenomenal idea in this down market. The podcasts were great! Thanks for paving the way in teaching how to use the internet tools to market one's business, and for your creative insight. Thanks for sharing such valuable information!!! I have listened to a couple of your podcast and I have gained a wealth of knowledge! Please keep them coming!!! Thanks for the good information. I know I'll be able to use this going forward. Thanks for the information. I love the convenience of being able to learn from my phone. Thanks again. Thanks Peter and Jerry for inspiring me to enter into new areas of real estate investing that I have not been involved in before. Your programs are first class. The podcasts are a great source of information on real estate investing, but if you do not have your own funds to do the deals, Jerry and Peter have some answers for you and have a system to follow to help you become a successful investor. These two guys are so creative and trustworthy. Their hearts are in the right place. The information they provide is for NOW, so you can make money NOW. This is great content. I like how you provide step-by-step instructions that beginners like me need, and not just a vague overview of flipping. I have the feeling you want your students to succeed and not just make money on bogus educational material. This is it. The banks are afraid of quality customers just walking away from properties. You have just shown me how my wife and I can complete our generational family financial planning, PRAISE GOD! This is presented so well and is so clearly explained even without the benefit of visuals... well done guys. But more importantly there is an incredibly valuable lesson to be gleaned... that it is VITAL to take your BRAIN out of its CAGE and think outside of the box. It opens up so many other possibilities; especially with commercial and jumbo loans. It also demonstrates that opportunities arise which will open doors for other deals. Jerry was smart enough to hear out the purchaser's attorney at closing and it proved to be incredibly profitable for him to spend that small amount of time to open and develop a relationship that will continue to provide profit time and time again. Though this was not the first time that I have listened to Jerry and Peters instruction concerning investing, it was, however, my first Pod Cast. As usual, I not only enjoyed the time listening to the training but also once again I found it very beneficial in the instruction given. I am in the mist of having several appraisals done and feel they may have saved me thousands when it comes to the outcome of the appraisal. Thank you Jerry and Peter for your straight forward training. I just want to thank you for the opportunity that you are giving us and I just want to tell you that all the content on your training is full of incredible detail. I have not seen anybody provide so much information for free. Everybody charges for e-books I have to tell you that I signed up for your 10 day free training today. All this information is well worth your investment. I have learned so much just from watching a few videos. You answer every question that I had about investing in Real Estate. I love your training. Very informative!!! Can't wait to hear more. This is the perfect time for these types of strategies to work. Very good and useful information. Being a Real Estate Agent I'm always looking for new and insightful ways to grow my business and help my customers. Thank you so much for providing new tools for my tool box. Well thought out with good content. The deeper I went into the different pod casts the more I wanted to here. I just love the back flipping. I live in an area where we have of the inventory with a lot of jumbo loans. Holy cow batman… There is gold in them thar hills. Jerry and Peter are the guys. Words would fail me if I try to articulate a review of your podcast. In a nutshell I would simply say your strategies are mind boggling and are TESTED and PROVEN. I enjoyed the Backflip Commercial properties and Why Investors Give Money for Flip Guy Deals podcasts. My attraction to those podcasts come out of my mission to make Big deals in commercial NNN, 1031exchanges and multi-unit apartment building transactions. Our LLC is about 3years old, we've got a Chicago law firm to source nationwide underwater, pre-foreclosure properties for workouts.. I am eager to put some potential deals together & send them to you. Wow, that was incredible guys! I just heard the podcast on how to make money flipping deals. I like the way you talked about the program where you fund the deals and flip 'm for them. I am also encouraged to give this a shot. Thanks, flip guys! You guys are RIGHT! This is the greatest opportunity for all of us in RE investing in a life time. Thank you for your conservative guidance and insight. The Back Flip strategy you are sharing should be a profitable opportunity for the foreseeable future. I am focusing my energies on this strategy and broadcasting to my network of Realtors and mortgage bankers. Deal opportunities are coming my way and will be submitted soon. Thanks so much for the opportunity to participate with the Flip Guys! Your iTunes podcasts are most informative, entertaining and thought provoking. Well done Peter and Jerry. I enjoyed them all. Thank you. I like the podcast. 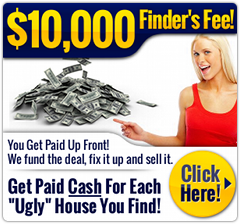 the info you talk about sounds to the point without fluff or asking for $5000 to show or talk about the tricks to flipping or any of that like you see with all the hype on tv. Thank you for the podcast. I find it very informative and great to listen to even in the car.